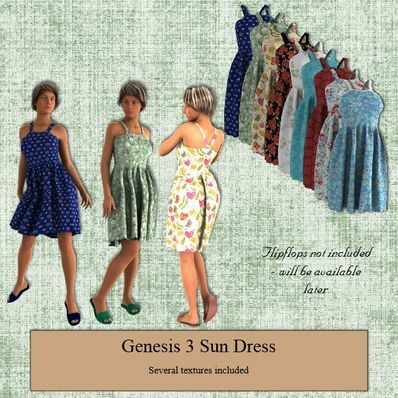 A Sun Dress for Genesis 3 Female for use in Daz Studio 4.6. Thanks so much for these. They're amazing quality. Perfect to try some renders on the new Genesis 3 female :D Thanks, Wilmap! Very varied and colorful, pleasing to the eye. Welldone. Oh good. Glad we got that sorted at last. I've resaved the dress and uploaded a new zip. Hope this one works OK, because I don't really know why it worked for me but not for marcoio. I'm using DS 4.8 64 bit. I'm still trying to try and find the problem, but so far no luck. Sorry marcoio but it works fine for me. I can't replicate either of your problems. Very timely, I have a serious lack of G3F clothes! Thank you! Very nice dress and very nice textures; thank you!! Nice addition to G3F wardrobe! Thanks. Thank for the movement handles and all the great textures. Love it!! Many thanks for this excellent download! The usual great work. Thanks! Wendy, thank you for this dress and all the great clothing for G3F, I still need to install DS4.8 and her! Super, as always, thank you. Thanks for these lovely Sun Dresses for the new G3F.